To Cite: Nozari N, Vahedi H, Radmard A R, Sotoudeh M, Divsalar P, et al. An Interesting Case of a Large Epithelioid Hemangioendothelioma of the Liver Presented with Lungs Symptoms, Shiraz E-Med J. 2013 ; 14(4):e16654. doi: 10.17795/semj16654. Introduction: Epithelioid hemangioendothelioma (EHE) of the liver is a rare vascular tumor. We introduce a case with EHE of the liver who is presented with lungs symptoms. Case Presentation: A 45-year-old man who was a known case of lung chemical injury due to exposure to mustard gas presented with a 2-year history of non-productive cough. He denied any gasterointestinal (GI) symptoms such as pain, diarrhea, constipation, bleeding, vomiting and nausea. Conclusions: Imaging study revealed a large lobular mass in liver along with lung metastasis. Pathology test result confirmed an epithelioid hemangioendothelioma of the liver. Epithelioid hemangioendothelioma (EHE) of the liver is a rare vascular tumor (1-4). EHE can present with nonspecific and heterogeneous clinical manifestations, variable symptoms and even without any symptom (5). We introduce an interesting case of a large EHE of the liver, associated with lungs metastatic symptoms. This patient has mild elevation in alkaline phosphatase (ALP) level but his transaminases level is normal. A 45-year-old man was a known case of lung chemical injury due to the exposure to the mustard gas in the war 20 years ago. Although he had lung injury following exposure to the mustard gas he remained free of any lung symptoms until recent years. He reported a 1-year history of non-productive cough. This cough was described as paroxysmal mostly during day time, unaccompanied by constitutional signs, such as fever. Although the patient’s cough persisted more than one year, the diagnosis of cough was not sought exactly during his prolonged period. He has been to numerous doctors for his conditions (COPD) but the medications were not effective. His appetite was good and denied any GI symptoms such as pain, diarrhea, constipation, bleeding, vomiting, nausea, melena, hematemesis etc. The patient’s coughing was noted to be vigorous in recent months and several chest X-rays couldn’t show any pathology in lung in past. Clinicians requested computed tomography (CT) scan of the chest which revealed lung metastasic lesions (diffuse small nodular lesions) and a large liver mass in few images of chest CT. The patient was referred to our GI clinic for more evaluation. His physical examination was unremarkable except for multiple nevus (brown papules and macula with regular borders and pigment) which were seen on his back. Laboratory data showed: WBC: 10300/mm 3 (Neutrophil: 60%, Lymphocyte: 22%, Monocyte: 1%, Eosinophil: 17%), Hb: 10.9 g/dlit, PLT: 223,000/mm 3 , ESR 1 st hr: 90mm, ESR 2 nd hr: 104mm, AST: 17IU/L, ALT: 29 IU/L, ALP: 417 IU/L (up to 306), T Bili: 0.3 g/dlit, D Bili: 0.1 g/dlit, PT: 15, INR: 1.3, PTT: 45, T protein: 7.4 g/dlit, Albumin: 3.6 g/dlit, Urea: 30, Cr: 0.9 ng/ml, CEA: 2.3 ng/ml, AFP: 1.3, CA 19-9:9 U/ml and LDH: 328 IU/L. Anti HCV, HBS Ag, and HBS Ab: negative. Peripheral blood smear just showed hypochromia, anisocytosis, and microcytosis in red blood cells. Serology of hydatid cyst was negative. Then, we requested abdominal and pelvic CT scans (Figures 1 and 2). An ill-defined hypodense mass is evident in segment 3 of left hepatic lobe (thin arrow), mildly extending to caudate lobe (curved arrow), which shows mild homogeneous contrast enhancement in delayed phase. There is also proximal dilatation of intrahepatic bile ducts at subcapsular region of left lobe due to mass effect (thick arrow). There are two peripherally located hypodense mass lesions in subcapsular portion of right hepatic lobe (segment 6) without significant enhancement in this phase. One of them shows central punctate calcification (thick arrow). There is also an enlarged lymph node at aortocaval region (curved arrow). An ill-defined hypodense mass is evident in segment three of left hepatic lobe (thin arrow), mildly extending to caudate lobe (curved arrow), which shows mild homogeneous contrast enhancement in delayed phase. There is also proximal dilatation of intrahepatic bile ducts at subcapsular region of left lobe due to mass effect (thick arrow) (Figure 2). There are two peripherally located hypodense mass lesions in subcapsular portion of right hepatic lobe (segment 6) without significant enhancement in this phase. One of them shows central punctate calcification (thick arrow). There is also an enlarged lymph node at aortocaval region (curved arrow). Radiologist reported that liver size was normal and its density was homogenous. There was a large heterogeneous and mild enhancing mass with lobular margin, measuring about 120×85 mm in the left lobe of liver which almost occupied the left lobe entirely. 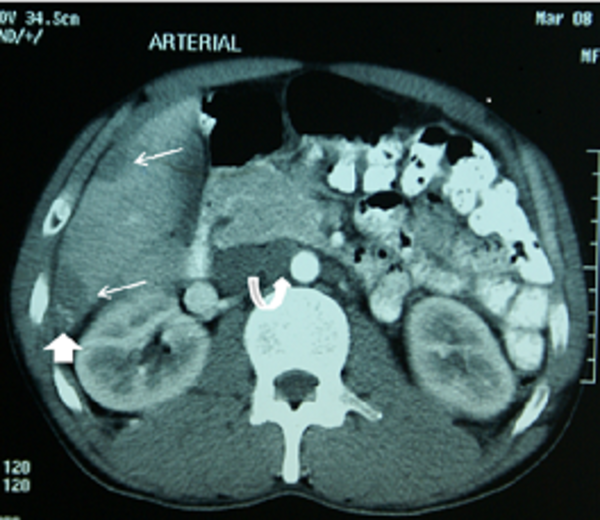 Large vascular of the left lobe was encased and displaced by the mass, but these were not seen within IVC (inferior vena cava) and portal vein thrombosis. At least four similar and smaller mass within 6 th segment of liver lobe were depicted. Conglomerated lymph adenopathies were seen in the celiac axis and peripancreatic region. Gall bladder, intra and extra hepatic biliary tree were normal and ascities was not seen. We performed needle biopsy of the liver under ultrasonography guide. Pathologist reported EHE diagnosis with immnohistology. (Figure 3) He was referred to an oncologist for chemotherapy due to metastatic lesions. Figure 3. (A). Epithelioid hemangioendothelioma. EHE is a rare tumor and often needs radiologic - pathologic correlation for diagnosis (1-4). We faced with a large mass in the patient’s liver but surprisingly he only presented with lungs metastatic symptom without any GI symptoms. 25% of EHE patients are asymptomatic but the common clinical symptoms are abdominal pain 48.6%, hepatomegaly 20.4% and weight loss15.6%.Other symptoms are jaundice, nausea, ascitis, anorexia, and fatigue. Cough has been reported in just 1% of patients (5). Although exposure with sulfur mustard gas could induce cough. He was free of symptom for a long period of time after exposure to the mustard gas. Other respiratory complications due to the mustard gas are chronic bronchitis, asthema, bronchectasis and pulmonary fibrosis. It is also reported that caricinogenicity effect on organs may be followed by exposure to the mustard gas. Yet there isn’t any available report regarding to association between EHE and mustard gas still (6). In this case, it seems that there is no relationship between mustard gas exposure and EHE. Most of patients (83%) have abnormal findings in laboratory data (5). Although there was a large mass in the liver and it is expected to see high level of ALP, this case showed normal aminotransferases level along with mild elevation in ALP level. Tumor markers like CEA and AFP are often normal and just exclude other primary and metastatic liver tumors (1, 5). Imaging feature can help the diagnosis including secondary capsular retraction (1-4), a multifocal appearance and peripheral location of the lesions (2), calcifications (2, 3, 5) and pulmonary nodules (2).The right lobe (5-8%) was involved more than left lobe (1%) in both multifocal and unifocal lesions (5). This case had a large mass in left lobe with typical appearance of EHE. Some clinicians recommended a definitive diagnosis by histopathology results because these signs aren’t specific (1, 4). EHE needs good core biopsy from target lesion and an expert pathologist. The histology beside immnohistology can prepare definite diagnosis (5). It’s difficult to distinguish between multicentric and metastatic lesions due to the nature of tumor (4, 7). In this case, it seems that the primary centre of tumor was in liver and then lung metastasis has occurred subsequently. Extrahepatic involvement was seen in 36.6% of patients at time of diagnosis and the most common site is lungs (8.5%) then regional lymph nodes (7.7%). We introduced a rare case of a large EHE of the liver whom presented with a dry cough without any GI symptoms. Imaging features enabled us to diagnose a large mass with lobular margin which pathology results confirmed the details. 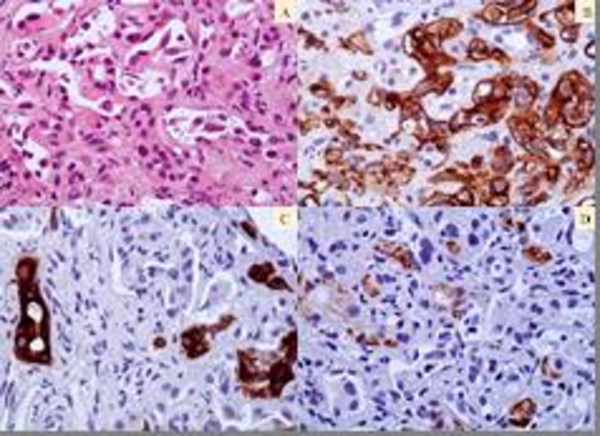 Histology evidences are helpful to avoid misdiagnosis with other tumors.